Broken and a shell of the man he once was, Union airship Commander Julius Montclair has fled his home and his friends. The pain of old wounds, both physical and mental, wrack his body and mind. A dire new threat looms on the horizon, and his service to his country is once again required, but Montclair is no longer certain he is the soldier he was… can he rediscover the elite warrior within himself in time to answer the President’s call for help? Scarred by the loss of her mentor, fiery-haired Department of Strategic Intelligence assassin Cecelia ‘Scarlet’ Alayne thinks only of bloody revenge. Her emotions have made her reckless, but she’s about to embark on one of the most critical and dangerous missions of her career. Can she set her rage and hatred aside long enough to complete her mission and attain the justice she seeks? Political mastermind and former Confederate President James Smythe has fled south, where he’s recruited new allies and a new army. 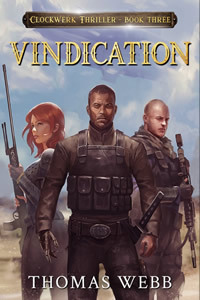 Emboldened by his growing forces, Smythe schemes to launch a military campaign that could threaten not only the Union, but ultimately the entire continent. With his plans of conquest renewed and the strength of foreign legions behind him, can anyone stop his march to Richmond to reclaim the Presidency of a Confederacy still reeling from his ouster?